RG6 Perma-Seal Compression Connector BAG of 25 CONNECTORS. 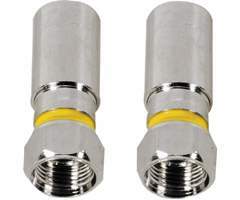 Weatherproof design F coaxial connector Nickel-plated. Large BAG of 25 Connectors. Great for Satellite and Cable TV Installations.